Order Your Copy Now. Choose Below. The Book The Food Industry Doesn't Want You To Read! What is THE FOOD BABE WAY about? Anyone who is tired of the food industry hijacking their taste buds and wants to take matters in their own hands and become their own food investigator, nutritionist and food activist. We have the power to change our health faster than anyone else and The Food Babe Way will show people how to do just that. "If everyone followed the 21‑Day Food Babe Way Eating Plan, the food system as we know it would crumble, and a new era of innovation and creativity would take root. Antiquated industries and food systems would fall apart and new, transformative food systems would arise. Not only would we all be healthier, but we would also reverse the epidemic of chronic disease and obesity globally crippling our citizens, economies, and environment." "The Food Babe is a one woman consumer protection agency... If you want to bring transparency to our food system and improve the health and well-being of our fellow Americans then you need to join this movement." "The book is an absolute must read, The Food Babe Way will change you and your family's health. You will never look at food the same way again." "Quite simply, this is a MUST-READ book for every American citizen. The Food Babe Way will not only make you a much healthier person, but it will educate you on the truly shameful and despicable practices employed by the food industry in our country. If there were ever a book that can single-handedly improve the health of our fellow Americans and create meaningful change in the way food is produced and consumed, this is it. The Food Babe Way is a true game-changer." "Vani Hari is a fearless leader in a new food revolution. I'm in awe of her commitment to heal the world one bite at a time. 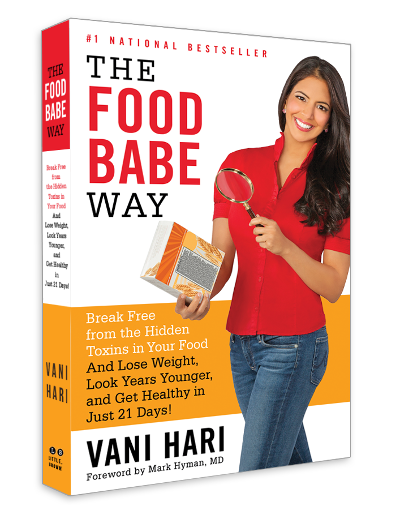 In her book, The Food Babe Way, Vani wakes us up to the truth about our food, our health and our future. I recommend this book to everyone!" "There's a reason big food companies are terrified of Food Babe. She findsout the truth about what's in your food like no one else, and holds food manufacturers accountable when they're selling you food products they know will make you sick. Now, in this fabulous book, she shows you how to be your own food investigator, activist, and nutritionist. She shows you how to get rid of polluting foods and replace them with ones that are truly healthy. Follow her plan and your life will be more vibrant, more beautiful, and more powerful." Hari has influenced how major food giants like Kraft, General Mills, Subway, Chipotle, Chick-fil-A, and Starbucks create their products, steering them towards more healthful policies. Hari’s activism has brought in worldwide attention as she has been profiled in The New York Times, The Atlantic, The Financial Times, Wall Street Journal, USA Today, and more. Hari has appeared on Good Morning America, CBS News, NBC News, Fox News, The Dr. Oz Show, The Doctors Show and CNN. She lives in North Carolina and is the founder of Truvani, a start-up offering real food without added chemicals, products without toxins and labels without lies. Get Your Book Now. Choose Below. Support The Good Food Movement. Choose Below.